There’s no doubt about it – SkyDrive (now OneDrive) is broken in Windows 8.1. At some point, your files may stop syncing, and Windows simply will not let you know. It happened to me across all devices I had upgraded from 8.0 to 8.1. Many forum posts: here, here, here, and here, are complaining about the problem. The real issue? Nobody knows. Microsoft hasn’t been helpful, either, turning a deaf ear to consumer complaints, and offering no advice in their forums other than to run their SkyDrive troubleshooter. What does that do? It simply restarts the SkyDrive service most of the time, which doesn’t solve the problem. Researching the issue a bit more, I noticed in the File Manager event log, a message of “Error message: Offline availability: found one item with an empty resourceId, aborting”. That sounded like a permissions/access issue may be causing a file to be unreadable. 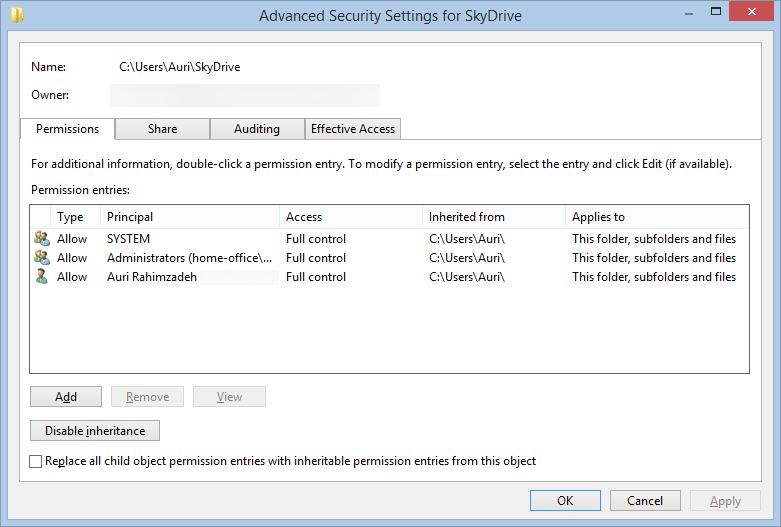 This lead me to try resetting all the permissions on the SkyDrive folder. Guess what? That process caused other pop-ups to appear. Pop-ups with error messages about file permissions being unable to be changed or accessed. Aha! Progress! If those files can’t be read by SkyDrive’s sync tool, maybe that’s holding up all my syncing! By moving out those files above and restarting the SkyDrive services, my sync is working again! I don’t know how long this will last, but I hope the steps below will help you troubleshoot the issue on your end. 1. Open Explorer and right-click your SkyDrive folder and select Properties. 2. Click Security, then Advanced, and you should see something similar to the dialog below. 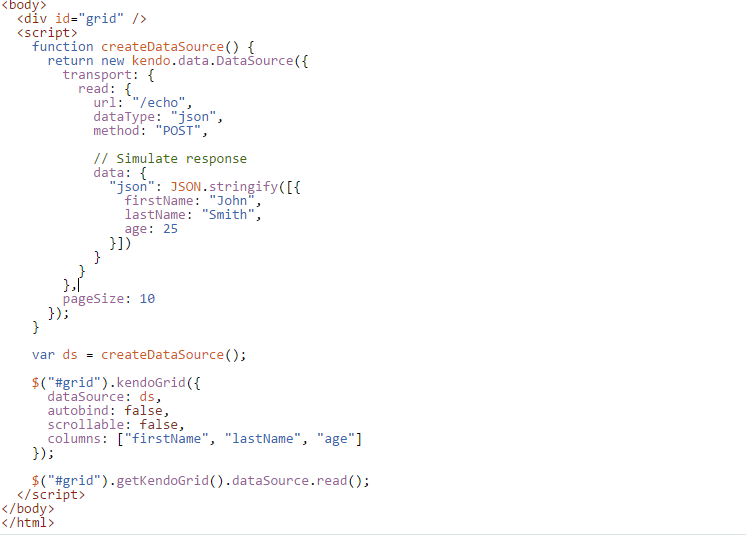 Make sure SYSTEM, Administrators, and your own user name all have Full control. 3. Check the box Replace all child object permission entries with inheritable permissions from this object and click Apply. 4. Make note of any files on which you receive errors so you can find them and move them out of the SkyDrive folder to somewhere else. This appears to be what was tripping things up for SkyDrive on my end. 5. Move the files from Step 4 to a folder outside of SkyDrive. I zipped these up and kept that ZIP folder in SkyDrive. I have not yet found the reason for those files to have issues. It’s possible setting their permissions again may fix it. My guess is some files may have domain credentials attached that may cause trouble, since I sync with my work PC. 6. 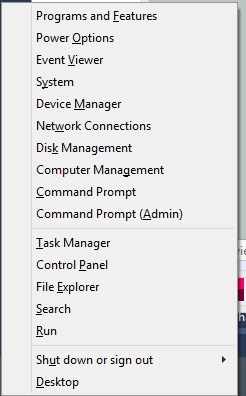 Open an elevated command prompt by pressing Windows + X and selecting Command Prompt (Admin). 7. Shut down SkyDrive by typing skydrive /shutdown in c:\windows\system32. You should be starting in c:\windows\system32, but if not, you can type cd “c:\windows\system32” to get there. Wait two minutes. 8. Start up SkyDrive by typing skydrive from that same prompt, this time without the /shutdown command, and wait two minutes. Launch the SkyDrive app from the Start menu as well, just to make sure everything’s kickstarted. 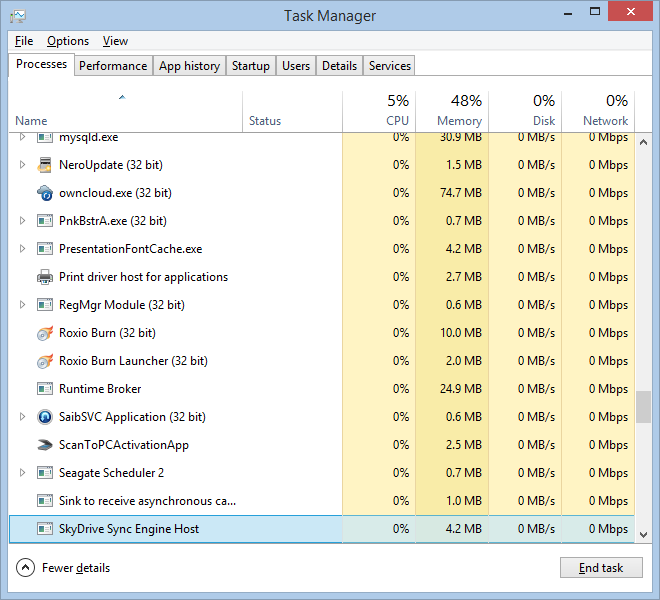 Check to see if the SkyDrive Sync Engine Host process is running in Task Manager. You can press Control + Shift + Escape to bring up Task Manager, sort by name, and find SkyDrive Sync Engine Host under Processes. If the SkyDrive process doesn’t launch after a couple minutes, try restarting your machine. 9. You’ll see a lot of disk activity while SkyDrive appears to scan your files and folders all over again. Depending on the number of files and folders you have to sync, this could take a while. 10. Check again in a few hours and see if your SkyDrive folder online appears to properly match with your machine. If it does, then my fix worked.